A solid roof is an integral part of any building. Without a good roof to protect you from the threats of hostile weather, none of us would feel safe even in our homes. The roof is exposed to extreme weather conditions. Yet, it is also one of the most often neglected parts of the house. Often, due to the negligence and lack of care, roofs require repairs and replacement. However, a roof might need repair in the course of regular maintenance activities as well. Roof repairing is a specialized task, which is best performed by experts. If your roof is in need of repair, it is important to get the help of a specialized service provider. Most importantly, any repairs should be carried out at the earliest as any delay could lead to structural damage to the building. Thanks to more than 20 years of expertise in roof repairs, we know colorbond roofs repair technique differs from that of the tile roofs. We undertake all types of colorbond roof repairing Sydney services. We ensure that your roofs are protected for a longer period. Once we repair it, the roof will enhance the beauty and value of your property. The shingles could crack due to the heat. Damaged or broken shingles can lead to bigger problems if left unchecked. Furthermore, the older roof shingles could be lined improperly or they might be damaged over the years. That is why we offer specialized services for roof shingle repairs. Regular repair and maintenance can save you money too. Australian weather can be harsh, which results in damages to the tile roofs. As an expert service provider, we are equipped to handle all your tile roof repair needs. Once we are done, your roof will look as good as new. We also offer regular maintenance services, so that your roof stays strong and clean for long. An emergency can occur anytime – even in the middle of the night. If you require emergency roof repairs, we are on the standby 24*7. We have the expertise and equipment to deal with emergency roof repair Sydney needs. Once we reach the spot, we will repair and restore your roof in no time. The edges and corners of the roof are the places where you can see the first indication of problems. If left unattended, this could lead to greater damages. As time passes, the materials holding the tiles and ridges together would weaken, resulting in cracks and splits. If it has come off completely, you may need re-pointing services too. Here is where our expertise and experience can help you. 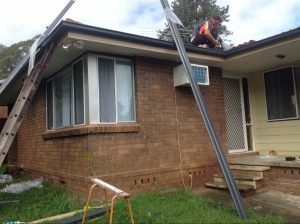 Our high-quality roof repairs Sydney are available at affordable rates. We also offer free inspection and quote. To know more, call us on 1300 337 796 or 0405 229 765.